The Yardie Creek Boat Tour vessel, 'Yardi' meanders along the creek below the escarpment walls. Award winning operators at your service. Mandy Francis-Maier and Peter 'Boxy' Maier will make your day on the creek as memorable and as enjoyable an experience as possible. Getting on board couldn't be easier. For those without a car, we provide a bus service to and from Exmouth to Yardie Creek and back. Conditions apply. See our Boat tours page for more info. The diversity of wildlife living along the rock-face is what makes the creek so special and such a joy for photographers to shoot. Cute little rock wallaby's, menacing western osprey's and elegant eastern egrets all find a home along the creeks walls. The kids from Year 7 at Exmouth District High School about to commence their tour. We now offer a bus service to and from the beautiful Turquoise Bay. Click here for more info. Two young Eastern Reef Egrets giving chase to Mum while a Yarie Creek Osprey looks on. Our steady vessel makes capturing the amazing scenery along Yardie Creek even easier. YCBT are delighted to be awarded another Certificate of Excellence from Trip Advisor for 2017 and we sincerely thank our guests for their great reviews and feedback. Below is a collection of popular keywords and phrases that can be found throughout all of our posts. You can click on any keyword to view a list of related post articles featuring that keyword. Tours depart at 11am and 12:30pm on scheduled days from the jetty at Yardie Creek - approximately 90 minute drive from the Exmouth town site. Prices subject to change at any time. Please contact us for price confirmation. Infants to 5yrs old FREE! Got friends who will be in visiting the area? Why not let them know about our facebook page. 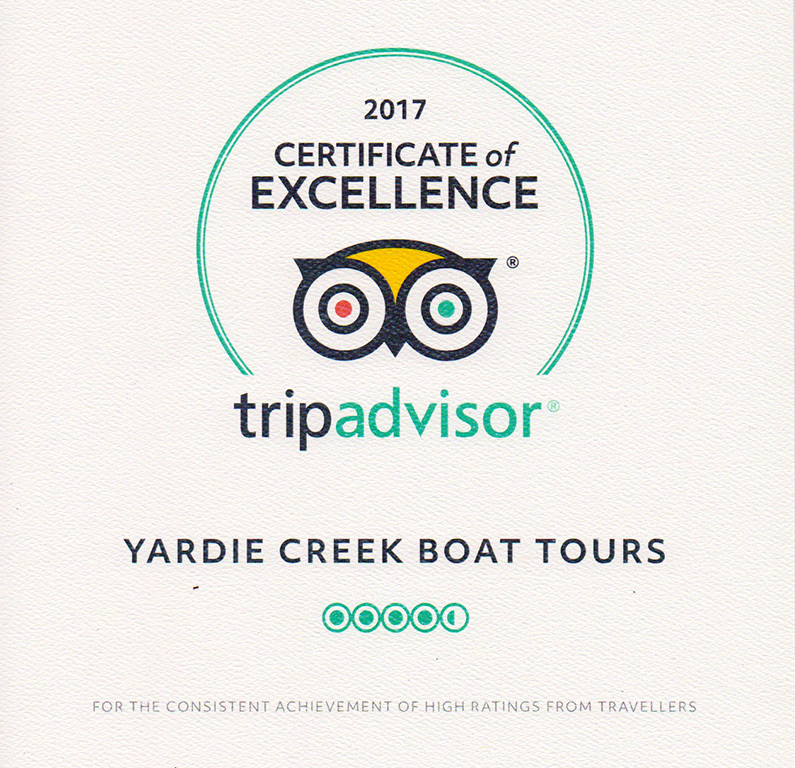 Yardie Creek Boat Tours has met the requirements of the Australian Tourism Accreditation Standard and gained Tourism Accreditation from the Tourism Council in Western Australia, signalling to our customers and to the wider industry that we are committed to providing a high quality tour service and experience!